In our last post, we discussed some of the important factors to consider when deciding whether to travel to Antarctica. In this post, we’ll discuss additional choices to consider. As we noted before, some trips go only to the Antarctic Peninsula, while others go to the Falklands and South Georgia, and still others (longer and correspondingly more expensive) go to all three destinations. Trips can be as short as one week, up to three weeks in length. When you go influences your experience. The season for visitors is the Antarctic summer, October to March. During the austral summer, the Antarctic’s marquee animal, namely penguins, come ashore, attempt to reunite with their mates from prior years and succumb to nature’s biological imperative to court, mate, incubate an egg(s) and finally, nourish a chick to maturity. Once born, newborn chicks require care, with parents taking turns going to sea to feed and returning to regurgitate krill-rich meals into the mouths of rapidly growing and hungry chicks, who must achieve a certain size and maturity before they are ready to take to the seas and forage for themselves. All of this activity takes place over a 4-5 month window. We’ve been to the White Continent in November, January and February. The breeding cycle begins in October, with penguins coming ashore from the sea. They immediately embark on reuniting with their mates, calling in a distinctive trill. Nest building consists of stockpiling pebbles on an ice-free patch of real estate. Once a mate is selected, mating commences and will be regularly observed. Penguin parents can be seen incubating eggs on their feet. Few chicks are seen this early in the breeding cycle. Going later in the season affords the opportunity to see recently born chicks, glimpsed under the protection of a parent. A Gentoo penguin parent attends to 2 rapidly growing and hungry chicks in tussac grass on Prion Island, South Georgia. As the chicks grow, they become too big to stay under their protective parent and are left in large nursery groups called crèches. Meanwhile, their parents forage for food in the ocean and can be seen coming and going from there. Penguin chicks are not born with waterproof feathers. Before fending for themselves at sea, they must go through a process of molting. Adult penguins also molt yearly while ashore in the summer. Beaches in the second half of the season may be covered with feathers. Penguins on nests for so many months become a collectively rather smelly bunch. This becomes increasingly evident later in the season. What is the best-sized boat? Another consideration in choosing a trip is how much time ashore you will have and do you need a dedicated photography trip; that is, how much photo pro support or instruction do you need or want? In general, trips suitable for photographers are on smaller expedition ships, not large cruise ships. Be aware, trips on larger cruise ships may seem attractively priced, but cater to a much larger number of people and make few if any landings. And while the scenery from the boat is attractive, for wildlife interactions, the closer proximity of landings is imperative! It’s very important to know the difference between an expedition ship trip to Antarctica and a large-ship cruise. There are restrictions on the number of passengers who can be on shore (generally 100 at a time). Vessels with over 500 people cannot land passengers at all. So, the ideal size of boat is one with less than 120 passengers or so. We’ve sampled 3 this size so far. In 2003, we traveled to Antarctica, Falklands and South Georgia with Lindblad/National Geographic on the Endeavour (now scrapped). My recollection is that there were about 120 guests on board. In 2015, we flew to Antarctica for a trip on the Ocean Nova, which took 72 passengers. The trip we just completed was on Poseiden Expedition’s Sea Spirit which held 114 passengers. Dedicated photography trip or no? Some trips have more of a photographic focus than others. This may or may not be an advantage. When we traveled with Lindblad back in 2003, it was early in their partnership with National Geographic. Our trip was billed as a Photography Intensive trip. That meant there were photographic professionals on board. Some of the presentations were geared toward photography and even post-processing because it was in the early days of digital imaging. Today, the presence of a National Geographic photographer on board a Lindblad trip is standard. Our 2015 trip was organized by Luminous Landscape and featured a slate of photography luminaries, including Art Wolfe. Most of the presentations were photography-specific and less focused on penguin biology, plate tectonics, polar exploration and other more general interest topics which had been presented on our longer Lindblad trip. The trip we just finished had two photo pros among the expedition staff of 11. Only 2 of the presentations given were photography specific. While they were enjoyable, we did not consider this a hardship. Consider this: with fewer “serious” photographers on board, there were fewer tripods to dodge on shore. Less serious shooters tend to step up with their cellphones in hand and move on after one or two shots. We are experienced enough to not need much instruction. With some destinations, one needs local expertise and logistical support to get where one wants to be at the right time of day. In Antarctica, the “right” time of day is when you see the shot. This can be ashore, sometimes from the boat itself or a zodiac. Light conditions generally were diffused and moody. The expedition team is focused on getting the passengers on shore safely. They will alert the entire boat to whale or dolphin sightings or unusually nice light. So, many of the logistical concerns in a photographic destination are addressed by the very nature of an Antarctic expedition. 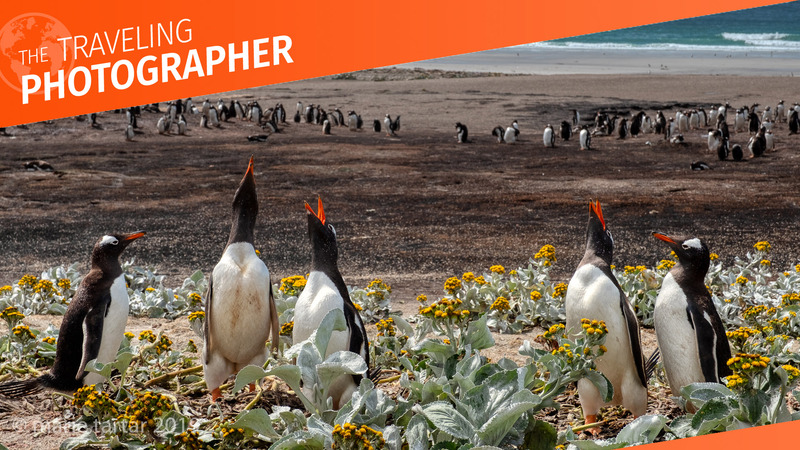 In our next post, we’ll examine specific photography-intensive trips to Antarctica and compare their offerings. Strange bedfellows: a macaroni penguin keeps company with black-browed albatross adults and their gray chicks in mud nests in West Falklands. Antarctica is one of the best place for photography especially in summer season. During the austral summer Antarctic’s marquee animal like penguins come and reunite with their mates which is a very nice experience to watch them and take photographs of those beautiful penguins.